Welcome to Riëd B.V. With customers in more than 105 countries all over the world, Riëd has grown to be one of the biggest supplier of structural adhesives. Products developed and supplied to OEM specifications. Riëd: developer, producer, supplier and trainer, all in one. One contact for all your challenges in the automotive and Industrial production. Pliogrip® Structural Adhesives are developed under the highest specifications for the OEM. Used worldwide by many OEMs, and with a global reputation for its high quality and strength. In addition to the Pliogrip®, Riëd is also globally respected for its 2K-PU for plastic repair and bonding, Epoxy for the metal bonding, MS Polymer, MMA, 1K-PU, and Cyanoacrylates. Please refer to our website for further information. Would you prefer a private label? No problem, Riëd belongs to one of the biggest suppliers of Structural adhesives for Private labelling. With our expertise and own production, we can supply you with any desired label. Looking for a different color mixer tip to match your private label? 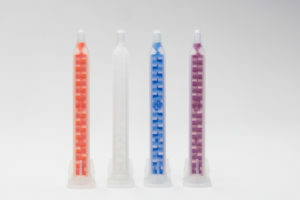 We have the Savemix® mixer tip 50 ml, also available in orange, purple and blue. But that’s not all! The Savemix mixer tip has some excellent benefits compared to other mixer tips on the market. Do you have any queries regarding this message? Let us know and we’ll be happy to assist you. If you fill out the form below we will contact you as soon as possible.